Post #2052: Not quite a superhero cape, but nevertheless…. My Woodland Stroll Cape is finished! I didn’t quite attach the closures properly (I realized too late that there should have been some overlap), and I couldn’t figure out how to line up the outer fabric and lining the stitch through the shoulder seams. I *did* topstitch around the entire edge which took out some of the puffy edges that I saw in other people’s finished items around the web – and I’m pleased with that. Besides the instruction to attach the lining at the shoulders – this pattern is easy to follow, and well-described. Because this garment is so straightforward, it lends itself to embellishment – embroidery or beadwork all the way along the bottom edge, for example, would work very well. The fabric I chose for this project is perfect – a vintage piece of wool (likely from the sixties) and a mid-weight shiny/slippery lining. The lining is quite visible on this piece, so co-ordinating is important. This is the second Liesl+S pattern that I’ve made and I really appreciate the clear instructions and pictures. These are some of the best indie patterns I have worked with (don’t get me started on the worst!) – and I really recommend them for any skill level. 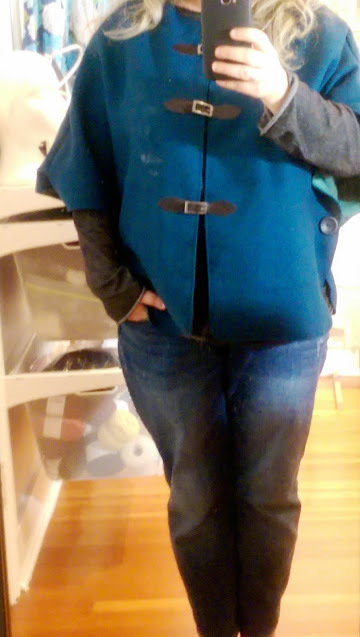 I don’t have a good shot of me wearing it, but here’s an attempt at a selfie in the sewing room mirror. I quite love the fabric, and my sewing isn’t bad either (if you don’t look too close) – but I’ve never worn a garment quite like this so it’ll take the right outfit to pull it off. I’m thinking long-sleeve black sweater underneath, pair of jeans, black high heels. Perhaps to the symphony this Friday night.